The wonderful Larmer Tree Festival comes roaring back to Salisbury 19th – 22nd July 2018. 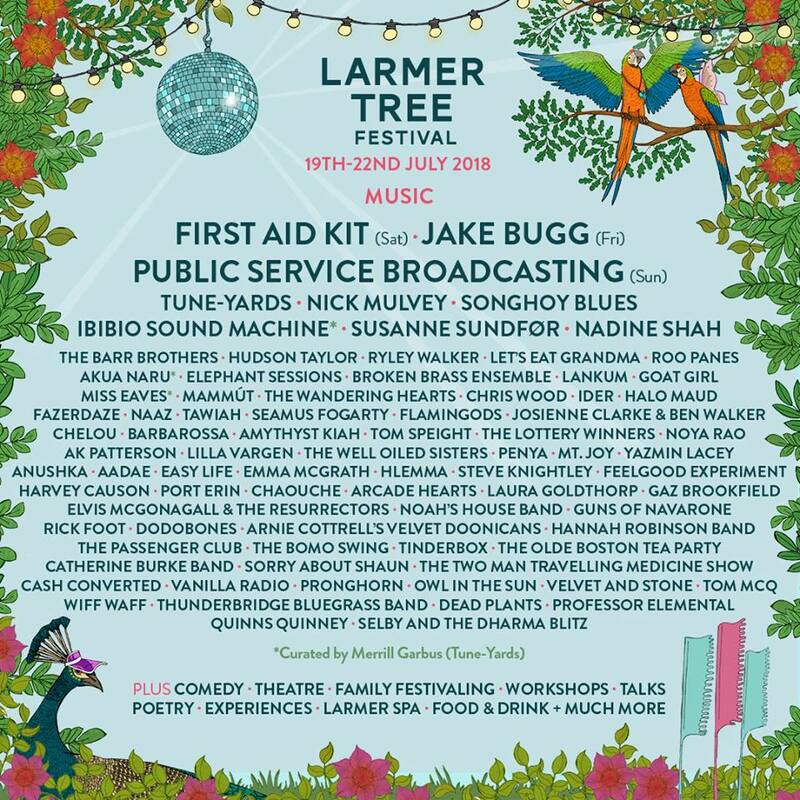 After a one-year hiatus, the festival returns fully refreshed, and with clean vest and pants, to boast a line-up including First Aid Kit, Jake Bugg, Public Service Broadcasting, Tune-Yards, Nick Mulvey, Songhoy Blues, Susanne Sundfør, Nadine Shah, The Barr Brothers, and Hudson Taylor. Festivals For All reviewers simply love the Larmer Tree vibe; take a quick look-see at the FFA Larmer Tree Festival 2016 Review for just a flavour of what this fantastic festival has to offer. Like any great festival, Larmer Tree is much more than just the bands… in fact it’s all a bit of a multi-media extravaganza with the music providing only one element in a many faceted weekend of festival delights. Set within the beautiful Larmer Tree Gardens, the festival is a zonal affair with multiple stages, dedicated kids areas and entertainment, intimate woodland malarkey, Spa experiences, and a fine array of locally sourced food and drink. As FFA said up front – the great music on offer around the site is not the half of it; there’s comedy, spoken word, workshops, theatre, debates, and loads of other cool stuff going down. The Lost Woods area is an FFA favourite with frankly bizarre pop-up happenings and intimate sessions. The site art and decorations are excellent. The Gardens themselves create a wonderful environment, with the stunning Water Gardens a particular highlight at any time of the year; overlay all that with a well organised, quality festival experience like the good folk at Larmer Tree Festival provide, and it’s a wonderful vibe. Musically the festival covers the spectrum with everything from folk to electronica across multiple stages, with some great late-night dance shenanigans – including silent disco! Old cliché but there really is something for everyone at this splendid Wiltshire bash. Saturday is sold out but there is currently some availability for full Weekend and other day ticket options. Our FFA reviewers will be riding the Larmer Tree wave again in 2018 – why not join us – it should be a cracker!